"Dreamers of the day are dangerous men for they act on their dreams with open eyes and make it possible"
Such are the minds involved behind Mirage 2014 - The Organizing committee. 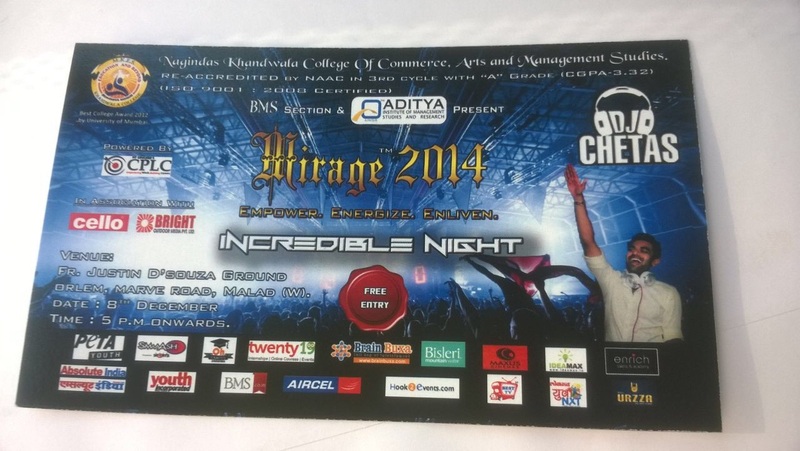 Mirage is an inter -collegiate festival organized by the BMS Section of Nagindas Khandwala College. It is 5 days long festival that is being organized, and has turned up to be a tremendous success over the years. With each passing year, Mirage is seen achieving new benchmarks and soaring new heights. Exploring a diverse range of the themes ever since its commencement, the theme for Mirage 2014 is " Global Fusion" celebrating and acknowledging diversity. This year Mirage strives to cherish the vaied differences around the globe and celebrate unity within the diversity. So hold on to your breathe steady, as thrill awaits you this time all over again for another life changing experience only at Mirage 2014. Empower. Enliven.